With his country still reeling from Super Typhoon Haiyan, Philippines delegate Naderev “Yeb” Saño made an emotional plea for meaningful action at the COP19 U.N. Climate Change Conference in Warsaw, Poland on Monday. In an address to the conference, Saño said he would fast until global warming solutions are adequately addressed. Through tears, Saño closed by saying “we can fix this. We can stop this madness” as the room gave him a rousing ovation. On the opening day of the two-week conference, delegates from almost 200 nations held a three minute moment of silence to mourn the victims. In addition to the official death toll of 1,744 people and 2,487 injured, which are both expected to rise substantially, with potentially up to 10,000 killed, more than 11 million are in need of assistance and around 670,000 people have been displaced. The U.N. on Tuesday appealed for $301 million in emergency assistance to help the beleaguered nation. Experts blame a combination of human and natural factors for the devastation wrought by Haiyan. Shoddy construction, massive growth in populations living in vulnerable coastal areas and extreme poverty contributed to the level of impact. However, while scientists don’t contribute single weather events to a changing climate, the research warns that global warming could be causing storms like Haiyan to get stronger. Climate change is also contributing to rising sea levels that add to storm surges that increase flooding. With his country still reeling from Super Typhoon Haiyan, Philippines delegate Naderev "Yeb" Sano made an emotional plea for meaningful action at the COP19 U.N. Climate Change Conference in Warsaw, Poland. With his country still reeling from Super Typhoon Haiyan, Philippines delegate Naderev "Yeb" Saño made an emotional plea for meaningful action at the COP19 U.N. 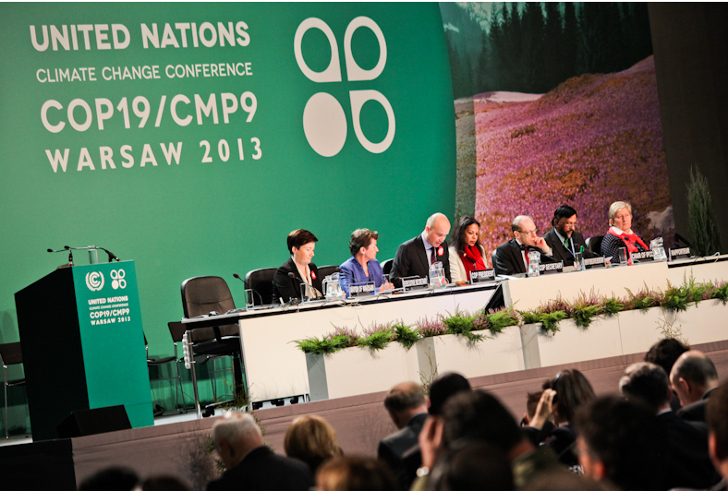 Climate Change Conference in Warsaw, Poland on Monday. In an address to the conference, Saño said he would fast until global warming solutions are adequately addressed. Through tears, Saño closed by saying "we can fix this. We can stop this madness" as the room gave him a rousing ovation.